Our HOPE is to provide for those in need within our community, and to build meaningful relationships with them, while leveraging the power of the Gospel to bring about life-giving change. For the past six years, this organization has been a labor of love, with the first three years being almost entirely self-funded. 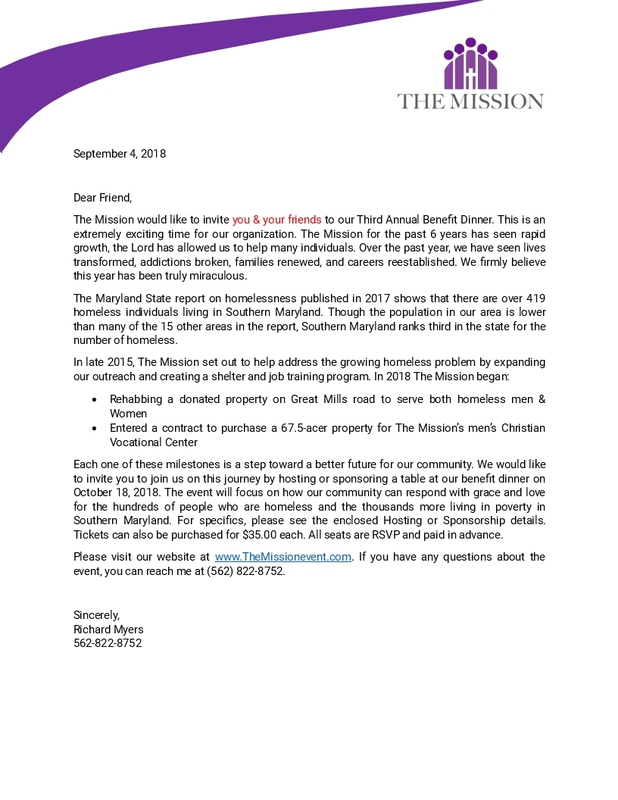 Starting in late 2015, God began providing us with resources to do more – first through a very successful fundraiser and later through the gift in Nov of 2018 of a three-building property which The Mission is turning into the Steve Kessler Christian Care Center, this center will serve homeless men and women of St. Mary’s County. We are committed to building an honest, open, and efficient Christian organization that engages the community and churches of Southern Maryland. We’re in our early stages, but we’ve put together an experienced, committed team. We hope that you’ll join us by praying, volunteering, and donating. We provided food for over 872 individuals. Over 330 homeless served in less than one year! Helping the Community One Person at a Time. Our doors are open to provide clothes to all that desire them. All clothes are free and are given in love. Why do decent homeless people make others feel uncomfortable? “I’m sure they’re only found in big cities,” some of us might think when considering the homeless, “[homelessness] doesn’t pose a real problem for the rest of us.” Finally we conclude “surely the big cities have systems in place which can handle the poor and we shouldn’t pitch in and help ourselves, after all its being taken care of!” Unfortunately, nothing could be further from the truth. Rebutting these profound jumps in logic, I can prove homelessness affects many people hailing from all walks of life. From the formerly rich and powerful to those born into poverty and dysfunction. Many people have spent their entire lives being sheltered and sheltering others, not from the cold, hail or elements, but themselves and loved ones from seeing the very fact that others outside their circle are poor and needy. Homelessness is a multi-faceted issue and not solved immediately, no matter how many leftist politicians in Washington want to throw enormous amounts of money to artificially house people to seemingly reduce their numbers. The mindset of homelessness lives on. People with money know that helping the homeless is a never-ending battle. Here are some of the reasons that I believe people find the homeless to be a tough pill to swallow. 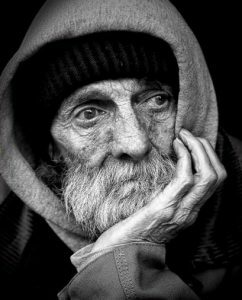 There is little separating us from the homeless in actuality, we are all people and equally susceptible to a stroke of bad luck. It would be much easier if there was something hideously different about homeless folks that would make them less sympathetic or relatable like having green blood or tentacles. Or perhaps something finite, differentiating and distinct about them that justifiably caused them to be 100% responsible for their own fate and undeserving of any help or support. Whether one feels sympathetic for them or not is up to that individual. What isn’t up in the air is whether or not we should help them. Jesus commanded us in Matthew 25:40-45: “And the King will reply, ‘Truly I tell you, whatever you did for one of the least of these brothers of Mine, you did for Me.” Why does Jesus say this instead of “ignore the homeless, they deserve it?” I think it’s because there is surprisingly little separating the businessman on his way to work and the homeless person he passes huddled in a blanket. And that it’s that thought of uncertainty which scares him, not his fellow hurting man. And if I’m being honest with myself, might I turn to drugs and alcohol if I’d hit rock bottom? Once again, the lines between law abiding citizens and those too depressed to function are surprisingly narrow. One who has never tried drugs or alcohol no doubt finds it easy to pass judgement, but they likely struggle with a different battle personally. Which brings me to my next point. We are committed to building an honest, open, and efficient organization that engages the community and churches of Southern Maryland. We’re in our early stages, but we’ve put together an experienced, committed team. We hope that you’ll join us by praying, volunteering, and donating.